William Yang was born in North Queensland, a third generation Chinese-Australian. He is known both as a photographer and for his monologues with slides which he has presented around the world to great acclaim. One of these, Sadness 1992, was adapted for the screen by Tony Ayres and won AWGIEs amongst other awards. 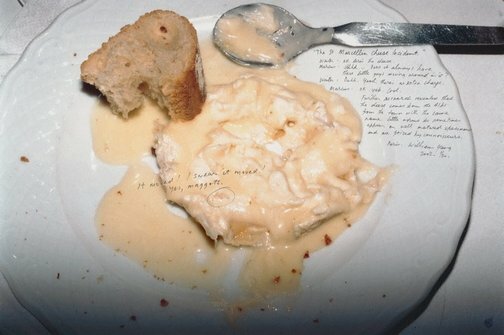 A major retrospective of Yang’s work, Diaries, was held at the State Library of NSW in 1998. Through April 24 - June 1, 2003 Yang presented all his monologues at Belvoir St Theatre, Sydney. Yang has documented various subcultures over the last 30 years and this is reflected in his photographs as well as his monologues. A remarkable storyteller with a unique style, his current work is a synthesis of his ongoing concerns. While these concerns spring very much from his experiences growing up with a Chinese background in far north Queensland, through to his exploration of the gay community in Sydney, the work transcends the personal and becomes a meditation on the subtleties of the ordinary and everyday. This series of images reflects Yang’s current life of travel and contact with his far flung friends and extended family. Though the subject, at its most superficial, is food, where, when and who is there at the time is of equal importance. Consequently each photograph in the series presents a web of connections and is underpinned with similar intentions to Yang’s other work, regardless of the subject. Signed and dated u.r.corner, black pen ".../... William Yang/ 2002 ...".